Buenos Aires, Argentina, 6 April 2017 – Argentina is rising through the ranks, while Mexico maintains its leadership in Latin America in the World Economic Forum’s 2017 Travel and Tourism Competitiveness Index, which measures 136 countries in terms of their potential to generate economic and societal benefits through a sustainable travel and tourism industry. The Americas macro-region boasts the second most improved performance in “tourism-friendliness”, just behind Asia-Pacific, with a growth increase in international arrivals from 170 million to 201 million between 2013 and 2015. Mexico maintains the lead Latin America, while it continues to close the gap with the United States and Canada: it rose 8 positions in this edition, now ranking 22nd globally. Argentina made its way to the top 50 this year, rising 7 places in the global rankings Three other countries in Latin America rank in the top 50 of the Index: Brazil (27th), Costa Rica (38th) and Chile (48th). 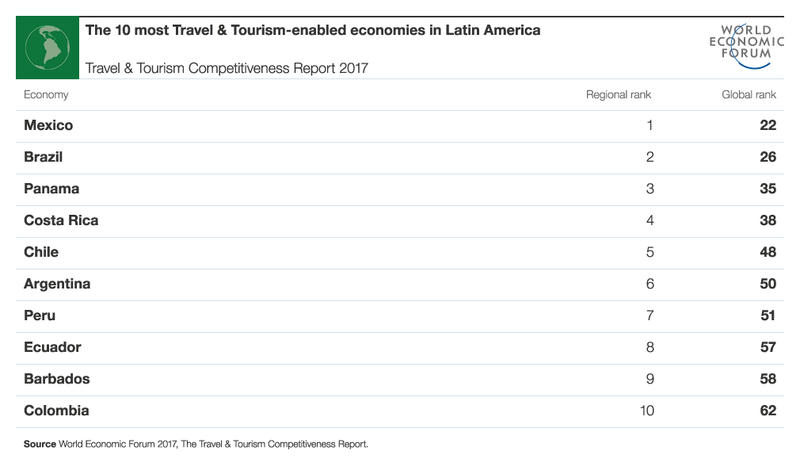 “Latin America has the potential to fully reap the benefits of a competitive travel and tourism industry,” said Tiffany Misrahi, Community Lead, Aviation, Travel & Tourism Industry, World Economic Forum. “To do so, it must continue putting in place policies that are conducive to drive this growth, create jobs and enable development”. Already welcoming over 90 million international visitors and accounting for more than 6 million jobs in the region, the Latin America and the Caribbean continues to experience considerable growth. The majority of governments in the region realize the strategic role of tourism as a driver of growth and job creation, and proactively support the sector. While the region tends to rely on rich natural resources and good hospitality to appeal to tourists, they could further enhance their competitiveness by narrowing the ground and ICT infrastructure gap, tackle security challenges and further value cultural resources. The Travel and Tourism Competitiveness Report ranks 136 countries across 14 separate dimensions, providing detailed country profiles that serve as a guide to the most prominent travel and tourism competitive strengths and weaknesses in each. Also included is an extensive section of data tables that cover each indicator used in the index’s computation. The World Economic Forum produced the report in collaboration with our data partners Bloom consulting, Deloitte, the International Air Transport Association (IATA), the International Union for Conservation of Nature (IUCN), the UNWTO and the World Travel & Tourism Council (WTTC).